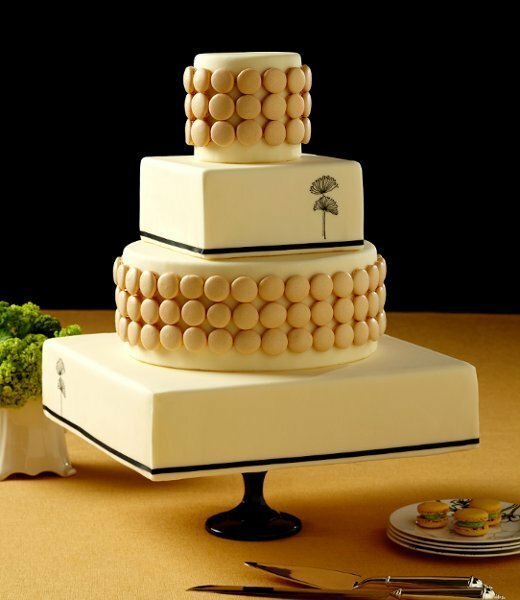 Square wedding cakes have gained in popularity over the last few years. While they still trail their round counterparts significantly, they are the second most popular shape that cakes take in today’s wedding cake world. 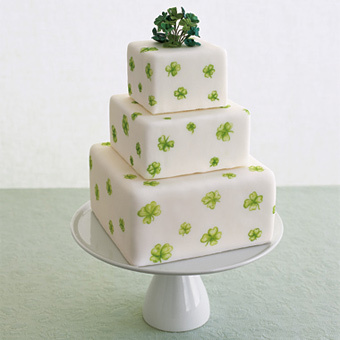 The couple who chooses a square cake may have a myriad of reasons for doing so. Maybe they just want something a little different. Or maybe a particular design feature that they have chosen works better with a square cake, such as a monogram. Perhaps the couple (or the bride, or the wedding planner or caterer) has a lovely old cake stand to feature, and it just so happens to be square in shape. Whatever reason, square cakes, whether separated by columns, or stacked with tiers directly on top of one another, emphasize the couple’s attention to detail. 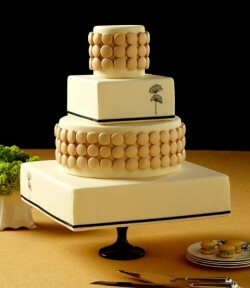 Round cakes are the default; square cakes must be requested, and for that reason, seem just a little more special. I love cake. And cookies. 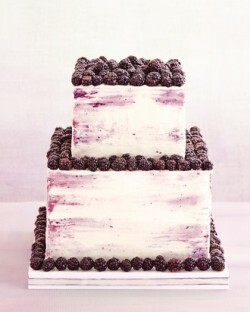 And when those two sweet treats are combined in a gorgeous and elegant wedding cake? Well that makes me a happy person! One of my favorite cookie is the macaron. And I love seeing macarons featured ON wedding cakes as a decoration. Summer is unofficially here! This means it’s time for fresh fruit and gorgeous wedding cakes – sometimes mixed together. 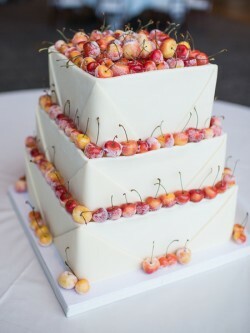 Today’s featured cake is the ideal summer wedding cake – a gorgeous white cake topped with sugar dipped cherries! It sure feels like fall today so that got me thinking about all things fall, like trips to the apple orchard. And baskets full of apples. Which brings me to today’s wedding cake inspired by baskets. I love the beach. Specifically I love how the color of the ocean can change throughout a day from dark blue to greenish-blue and back again. 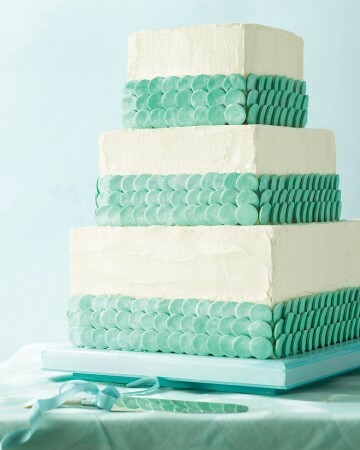 This wedding cake reminds me of my favorite ocean color – that sea green-blue when the water is clear and you can see to the bottom. 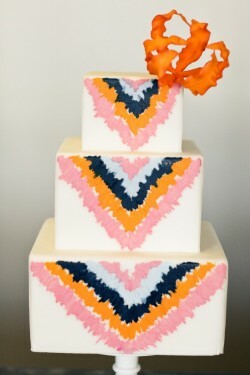 There is nothing simple or old fashioned about this modern and very colorful wedding cake. And I think I kinda like that. 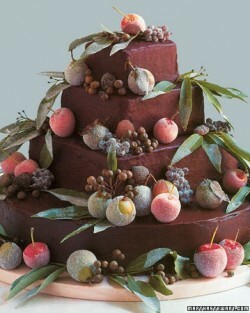 Sure, I’m normally a traditionalist when it comes to wedding cakes but there’s something unique about this cake. Things are still all a bloom around here thanks to a nice combination of April showers and warm, sunny days. Which means I’m still looking for wedding cakes adorned with fresh flowers because they’re absolutely perfect for spring weddings. 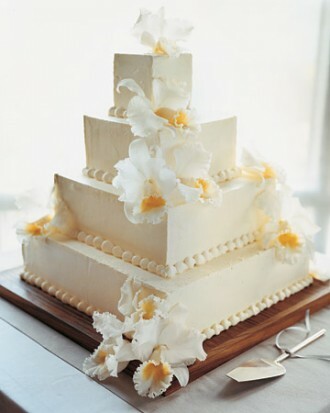 This four-tier square wedding cake is elegant and simple and has a fresh feel about it. 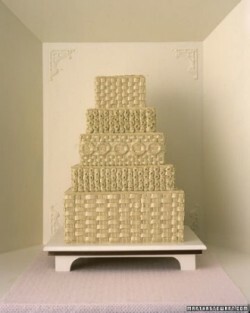 The square tiers give the cake a modern feel, while the pearl icing embellishments add just the right amount of elegance. And you can’t go wrong with fresh cattleyas for a floral addition. Of course if you aren’t a fan of that flower you can always adorn your cake with a flower that matches your bouquet – giving your wedding cake an extra personal touch. 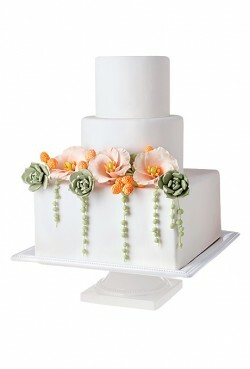 You can find this spring floral wedding cake here. I’ve recently decided that I need to eat more fruit and fresh berries are currently on the top of my list of must-have snacks. So, when I saw today’s wedding cake I just knew I had to share it with you because it looks delicious and it would be perfect for a spring or summer wedding. It’s the first day of April and spring is in the air and that’s no joke! As I look outside I’m spying buds on the trees and tulips popping out of the ground and I’m convinced that the warmer weather is here to stay. Which means I just had to find a gorgeous wedding cake today with springtime flowers!